Backaldrin - Improvers, Premixes, Sourdoughs etc. for the world of baking. Credin A/S - raw materials (flour, baking powder and other ingredients), convenience products. Diamant - nahrungsmittel raw materials (flour, baking powder and other ingredients), convenience products. Döhler Natural Food - raw materials (flour, baking powder and other ingredients), convenience products frozen goods, pre-baked products and snack products. Dreidoppel GmbH - raw materials (flour, baking powder and other ingredients), convenience products. Hanf Dampf - hemp raw materials (hempnut, dehulled hempnut, roasted hempnut, hemp-oil). Ireks GmbH - raw materials (flour, baking powder and other ingredients), convenience products. Mec3 - Products and ideas for ice-cream and pastry - semimanufactured products and ingredients for ICE-CREAM (stabilizers, emulsifiers, classical and special milk pastes, fruit concentrated pastes, toppings,...) and PASTRY (products for semifreddo, cakes, mousse, dessert and custard cream, ... ). Muehlenchemie GmbH - raw materials (flour, baking powder and other ingredients), convenience products. Rietmann Laboratory and Production - Tailor made premixes and concentrates for industry and bakery suppliers. S.I. Lesaffre - Baker's yeasts (Instant and active dry), pizza yeast, yeast with reducing activity, yeast sensitive to cold temperature, starters for sour-doughs, ready to use sour leaven. Bread improvers, dough conditioners. Yeast extracts for the food industry. Uldo Backmittel GmbH - raw materials (flour, baking powder and other ingredients), convenience products. Uniferm GmbH & Co. - raw materials (flour, baking powder and other ingredients), convenience products. Walter Rau - raw materials (flour, baking powder and other ingredients), convenience products. 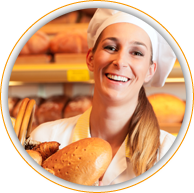 Zeelandia - innovative producer of baking materials for bread and pastry. Supplier of product en marketing concepts. Creating possibilities for the baker.